My interest in yoga began in 1998 when I was looking for a way to relieve stress during my Master’s studies at the University of Toronto. I got more than I bargained for when I signed up for a yoga class offered by the University sports centre: I fell in love and discovered a new way of approaching life. That love has sustained my practice now for over 15 years. I have practiced ASHTANGA VINYASA YOGA under the guidance of Alison Ulan (Ashtanga yoga Montreal), and Michael Stone (Centre of Gravity, Toronto). 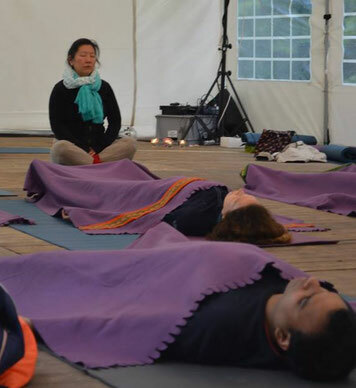 In addition, I have practiced Iyengar yoga with Berber Geerts (Iyengar Yoga Studio Groningen) since 2002 and have taken courses and workshops in Anusara-inspired yoga, Hatha yoga, Vinyasa yoga and Kundalini yoga. I embarked on a 2-year apprenticeship with Alison Ulan (a senior student of the now deceased Ashtanga guru Sri. K. Pattabhi Jois) in 1999 and completed a teacher training course with David Swenson, an internationally recognized yoga practitioner, in 2000. Currently, I finished a 200H Hatha teacher training course by the teachers, Kenny Graham and Tony Guiliano. I teach the Primary Series of Ashtanga vinyasa yoga (athletic, flowing) flavoured with the precise, technical approach to alignment of Iyengar yoga. My classes are rigorous and physically demanding but taught within a calm and accepting atmosphere. I teach in English but my spoken Dutch is nearly fluent.